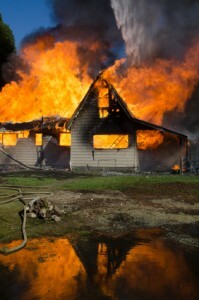 Ok, so your home survived a fire, now what? The logical next step, after emotionally collecting yourself, is to get the placed cleaned up. Most homeowners just automatically want to source out the problem. They have already gone through so much that hiring a professional to clean up the mess seems like the most hassle-free way to resolve the problem. However, some people just simply feel like they can’t afford to hire a cleanup crew, and they would rather opt to remediate the smoke damage themselves. The truth is that you can go either way, but there are pros and cons to each side. Some situations do require the expertise of a professional, while other jobs may be okay with a more homemade remedy. The key is understanding when it is appropriate to tackle the job yourself, or to call on a professional. If you feel like your walls have minimal soot and smoke damage, then you may want to try to clean them on your own. If you make this decision, then it is important to take into consideration the type of materials you are restoring. Plastered walls cannot be treated with water-based cleaners because they will actually do the opposite of clean and cause the soot to set even deeper into the wall. Instead, use paint thinner and rubbing alcohol to clean the stains. If you are treating a satin or semi-gloss paint you can create a cleaning agent out of one gallon of water and one tablespoon of trisodium phosphate that can be used on those types of walls. Rinse the area with water after applying each application of the trisodium phosphate, alternating between the two until the smoke and soot have washed away. When cleaning walls yourself make sure you are wearing both goggles and rubber gloves, especially since trisodium phosphate has the ability to cause chemical burns. Also keep the doors or windows open when working with chemical-based cleaners to facilitate ventilation. Although it is possible to implement damage control yourself, sometimes it is just too severe and you need the help of a professional. This could be due to the intensity of the smoke stains, or because of all the ash and soot left behind from the fire. Too much of any of these substances can cause corrosion, discoloration and leave a strong odor. Leaving this type of smoke damage untreated for a significant period of time can be detrimental to both the structure of the home, as well as the possessions inside. This is due to the acidity of ash. The longer it sits, the more damage it does. It usually takes more than just cleaning smoke stains off walls to get the home back to its normal self. Most likely carpet, wood flooring, glass doors and windows, fiberglass, metals, upholstery and vinyl will all need to be replaced. Finding a company who knows how to do a thorough job will ensure that the smoke, ash and soot are removed from the premises, unsalvageable items are disposed of and that the odor is neutralized. Hiring a company to get the job done can sometimes be as much of a headache as just doing it yourself, so it is important to do your research before allowing anyone to begin the cleanup. Whoever you hire should be properly trained and certified in fire restoration, that way you know you are getting an experienced team who can clean the home quickly.